‘Indivisible’: Poetry to my Ears! ‘Indivisible’ is a collection featuring the work of 49 poets of South Asian heritage – originally from Bangladesh, India, Sri Lanka, Pakistan and Nepal – and 11 of the poets participating are NYC-based. Among the names you might recognize are renowned journalist Amitava Kumar, writer Bushra Rehman, poet and essayist Vijay Seshadri and novelist Monica Ferrell. The anthology is edited by Neelanjana Banerjee, Summi Kaipa and Pireeni Sundaralingam, all three well-respected poets and writers in their own right. Of course, for all the details and full bios of the editors, go to the ‘Indivisible’ website, by clicking here. Here at The Ajnabee, we always look at things from a personal prospective. 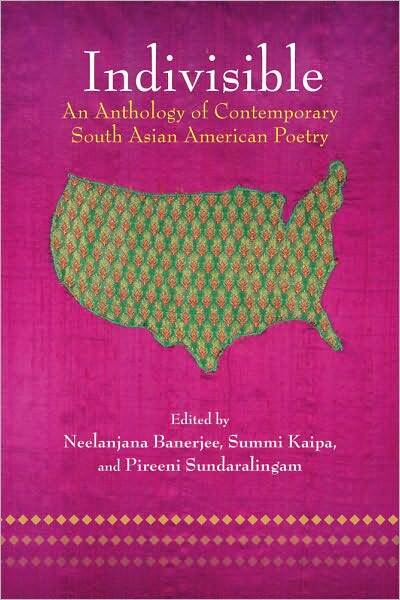 And, personally, I know one of the poets featured in this wonderful anthology, the beautiful – inside and out – Purvi Shah, who was the inspiration for this piece. I met Shah during one of her last days at SAKHI in NYC – Sakhi is an organization created to help South Asian women who are the victims of domestic violence – a wonder onto itself, which you’ll have to read all about on the AVS blog. 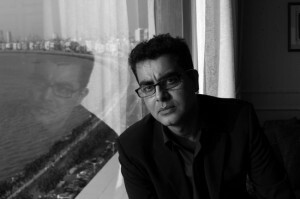 Shah’s debut book of poems, ‘Terrain Tracks’ (New Rivers Press, 2006) explored migration as potential and loss, won the Many Voices Project prize and was nominated for the Asian American Writers’ Workshop Members’ Choice Award in 2007. Shah, who holds an MA in American Literature from Rutgers University, is a former poetry editor of the Asian Pacific American Journal and the recipient of a Virginia Voss Poetry Award from the University of Michigan. Born in Ahmedabad, India, she lives in New York City. The book has already won acclaims and accolades, and there have been group readings by some of the authors in San Francisco, Denver and Los Angeles. Former US Poet Laureate Billy Collins has said that ‘Indivisible’ “…Deserves a place among the best anthologies of poetry.” And if the below poem by Purvi Shah is any example, I suggest running not walking to your closest bookstore to purchase a copy. Not sure where your closest bookstore is? I am a bit disappointed but still, do not fret… Amazon.com is stocking ‘Indivisible’ right now. If you are in the New York area this weekend, there will be a reading this Sunday at Unnameable Books in Brooklyn. Just think, you can make your copy extra special by having some of the contributing authors sign it. And having spent time around Amitava Kumar at this year’s Jaipur Literature Festival, I highly encourage you to attend and experience his deadpan expression and his insightful observations. You are guaranteed to be enriched by the experience. Check out the event’s info below. Featuring contributors: Mona Ali, Amitava Kumar, Bushra Rehman, and Vijay Seshadri. Finally, I leave you with the magical words of Purvi Shah, who has shared one of her poems – featured in the ‘Indivisible’ anthology, as well as her debut book ‘Terrain Tracks’ – with The Ajnabee readers. N-joy and remember, poetry is the language of love: love for yourself, your earth, your fellow human beings and your universe! If you learn one thing this month, let it be to share and appreciate this love! has been pounding iron again. of channels, spirit mobile, expanding. This entry was posted on Thursday, May 6th, 2010 at 3:28 pm and is filed under The List.